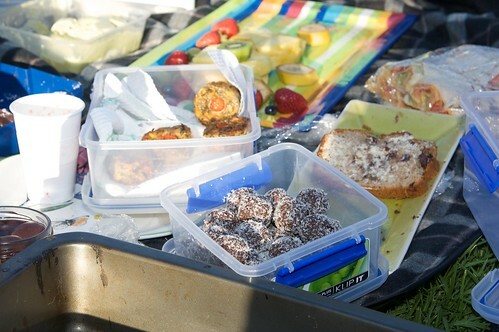 Yesterday we went on a Vegan Pot Luck Picnic to Princes Park, just a short tram ride from our house. There were lots of Melbourne vegans in attendance, and this resulted in lots of yummy vegan food. In an amazing turn of events for any picnic, most everyone arrived at or close to the start time. This was because Cindy had let us know that she would be bringing savoury ice cream, and as it was a picnic the ice cream would simply have to be eaten first, before it melted! This was a lie. Although the weather was warm, it took the ice cream a good half hour to soften sufficiently for serving! Opinions were divided on this new treat. 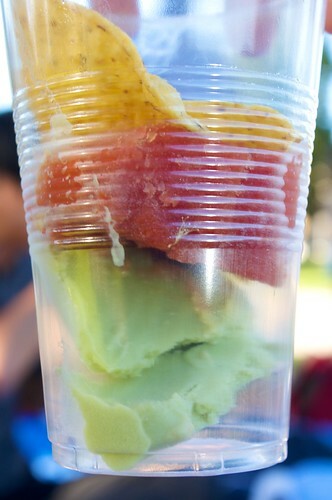 Cindy provided us with two savoury ice creams to sample, one avocado and one tomato. 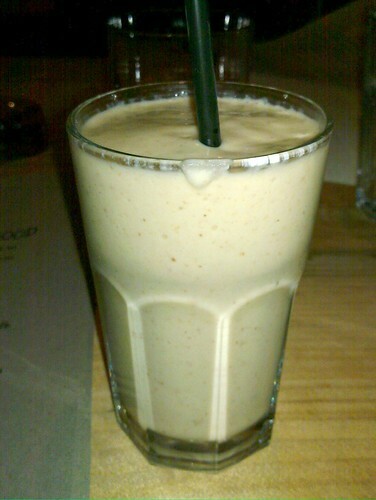 The avocado was likened to eating frozen guacamole; the tomato, to frozen tomato soup. Cindy has blogged the recipe and process here. In the meantime, as we waited for the ice cream to melt, we started in on the ample savoury goods. It was awesome to meet Carla for the first time. 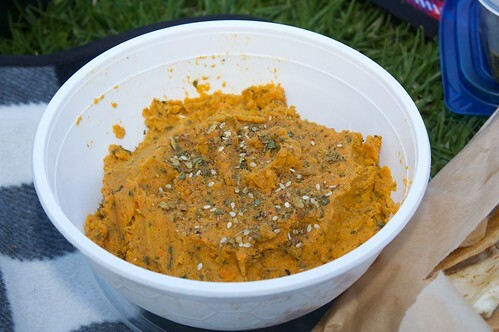 She brought along a delicious roast carrot dip, and a great basil pesto. Both of these were amazing deliciousness. Vicki brought along a muffaletta. I was really excited about this because I haven't had one in ages! It was really dense, and filled with pesto, sun-dried tomato, capsicum, olives, and artichokes, and I think perhaps some other things I have forgotten. Tahn brought some wraps filled with hommous, avocado, carrot, lettuce and some other delicious things. They were tightly wrapped and soft and squidgy, which made them lots of fun to eat (and dare I say it, even more delicious than usual?). She also brought three children, Popeye, and a whole lot of fruit and some chocolate banana bread (which I didn't get to try! sadface). She's already blogged about the picnic here. 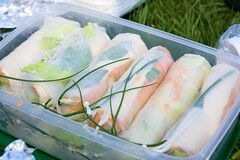 Other raw and refreshing foods were provided by Craigiepants (has a blog, refuses to use it), who brought along some rice paper rolls. 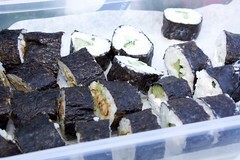 He claimed that these were poorly rolled, but he lies, because these were well rolled and very delicious. Bec made vol au vonts, and these were GIANT. 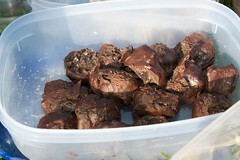 Fortunately they were delicious (so delicious that Toby refused to share them). The pastries for these were store bought, so they do exist! 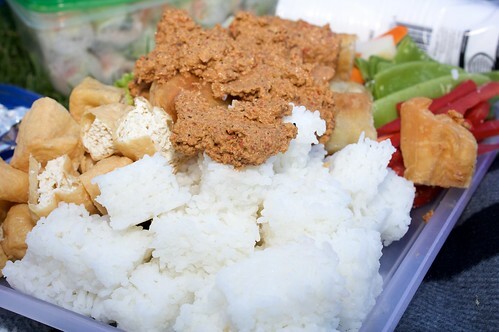 I brought along some gado gado. I love making gado gado and lontong! It's all cold and squishy and delicious. I use the same recipe every time, which I've previously blogged here. 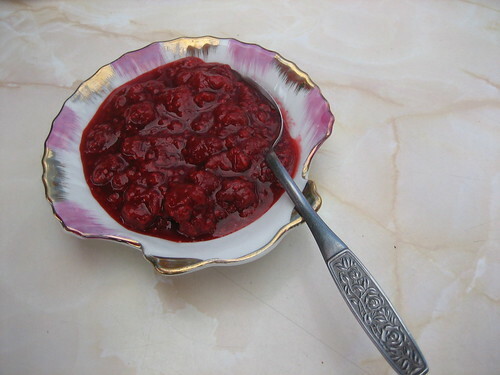 Plus it gave me the opportunity to use up the yao chao guai that had been languishing in the freezer for two months. 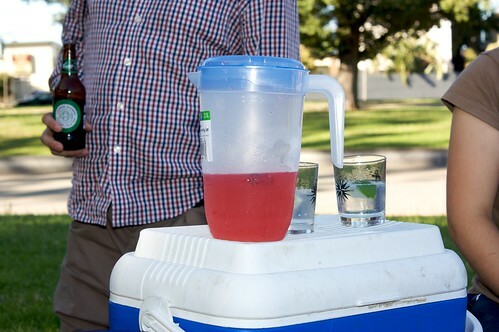 For drinking, we had an assortment of picnic delights. Kristy made up some raspberry lemonade (with actual raspberries lurking in the pitcher) (recipe here), and then we ventured into alcoholic territory with some gin and tonics, and a whole lot of beers. 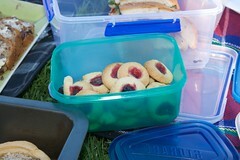 I wished desperately that I had brought some pimms, but our picnic basket was just too heavy! Utilising the recipes of others, Lisa brought some chocolate hedgehog slice (based on my recipe); and D made some oreo truffles, based on sj's recipe. 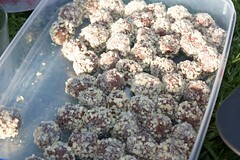 Johanna made some more truffle-y things (awesome), and something sweet and fruity that I didn't get to try, I was so stuffed! Did I miss anything? I'm not sure, there was so much food and it was so incredible. 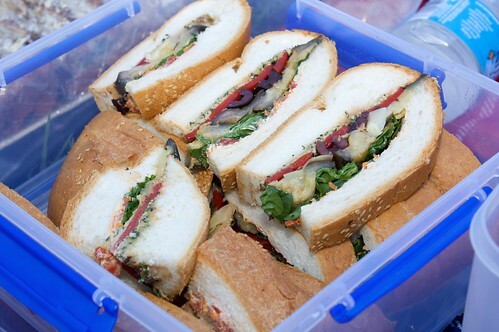 This was an amazingly delicious picnic, and I was so delightfully full at the end of it. 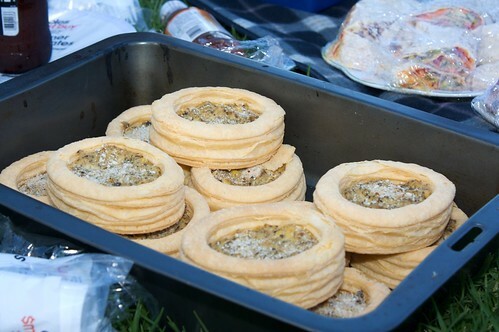 There should be more awesome vegan picnics! I struggled to find a cafe open on Sunday morning for breakfast, but eventually discovered that Lentil As Anything at the Convent would be doing breakfast, so early Sunday morning SJ and I headed out to Abbotsford. I'd never been to Lentil at the Convent before, but I've heard a lot about it. Pip bakes on occasion for them, and I was looking forward to seeing what they had to offer for breakfast. What they had to offer wasn't extensive. It's unclear from the menu what's suitable for vegans, and when I asked I was offered only the one option, the Mushrooms. Don't get me wrong, these mushrooms were amazing, the tomato and spinach and the spices all combined to awesomeness, and I really enjoyed it. But SJ got to order the Sri Lankan Breakfast which looked suspiciously like dosa, so I was a bit disgruntled that the filling was an egg and potato curry. Alas! No cakes to appeal, I suspect because it was the day after Boxing Day. Internets, today I made Cindy and Michael's vausage rolls AGAIN. This is like an obsession, and I don't even care. They are amazing. Tomorrow's food plans are waffles for brekkie (D got me Vegan Brunch for Christmas), and then probably the rest of these vausage rolls. I'd say I was going to take some of these to the potluck I'm attending on Tuesday, but if I'm really honest with you all, we'll probably have eaten these by then (SJ, you are welcome to drop by and try these since you have yet to sample their delights). Cook them now! I recommend it. This was our first Christmas away from our immediate families. Usually it's all go go go, from Christmas Eve through to sometime Boxing Day, but not being in close proximity to family meant that in the end, we had a very quiet couple of days. After a very simple breakfast of field mushrooms on toast, I got started on some cooking and D got started on some cleaning (pausing every three minutes to send another IM). 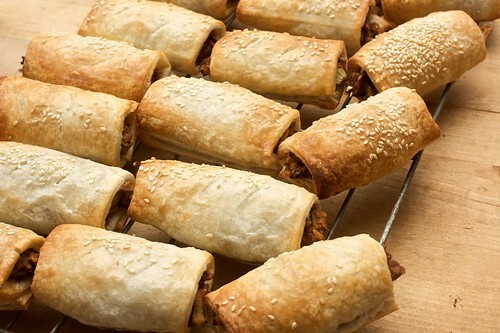 I prepared filling for Cindy and Michael's revolutionary vegan sausage rolls (vausage rolls) on Christmas Eve, but that was the extent of my advance preparations. I'd not prepared a roast meal before, not on my own, so I smsed D's mum to ask her advice regarding roasted potatoes, drank some Pimms, and then got started. 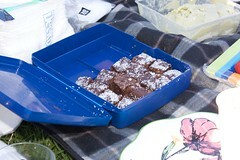 In the meantime, our guests turned up, with delicious supplies! 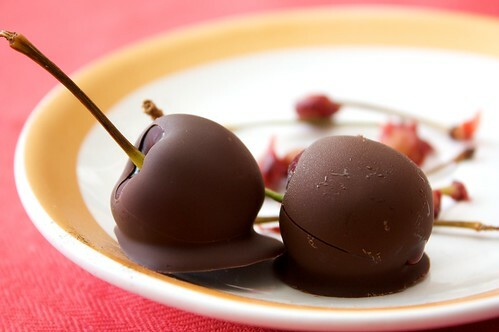 JS brought these amazing and simple cherries, which had been dipped in melted Lindt chocolate, and then frozen. The ice in the middle of the cherries made this simply superb, and I ate a lot of them. She also provided some wreath-shaped brushetta! 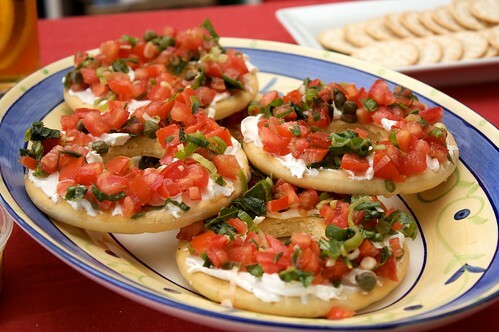 These were served with tofutti cream cheese, tomato, spring onions, capers, and parsley, and were also amazing! A trick I learnt from my dear friend Dr.G is the roasting of giant field mushrooms, so when I saw some for sale at the markets on Thursday, I knew that they would be added to the roasting pan. I also roasted butternut pumpkin, and potato. Other additions to our lunch time feast were potato salad, pasta salad, the Sanitarium vegie roast thing, and of course the vausage rolls. It was all of deliciousness! 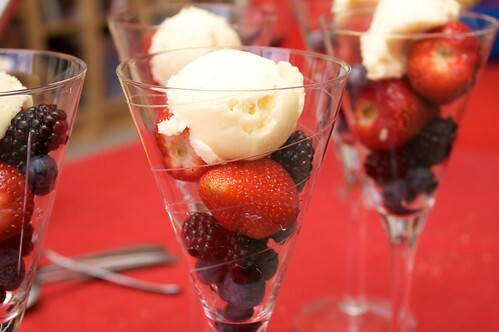 We rounded out the meal with fresh berries and sorbet. Finally, much later in the day, D and I ventured outside of the house to Enlightened Cuisine, where we had delicious Chinese noms for a moderately filling dinner with Kristy and Toby. Hooray! I love whole days of eating. Extreme heat plus a lack of air conditioning in House of K + Toby saw us and Jo make an impromptu visit with them to the new vegetarian, somewhat organic and raw restaurant on Brunswick Street in Fitzroy this evening. Please forgive the photos, they were taken on Danni's new N900. We stepped inside, only to discover that although the air was slightly cooler, there was no air conditioning and no fans. So we started by ordering some drinks, a whole lot of mango lassis and I, the lone dissenter with a chocolate banana milkshake. 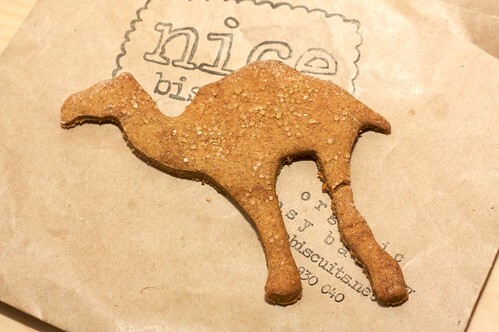 K and I both opted for raw meals, as the restaurant heavily promotes this. Tempted by something I absolutely knew I wouldn't make at home, I ordered the rawsagne. At first bite, the cold density felt odd, but as I got used to its rawness I began to really enjoy it, and although the portion size looked small, I felt well sated by the end of it. I would eat this again. 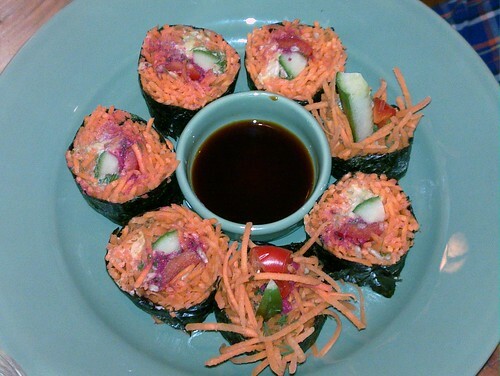 K, claiming to not be that hungry (later proven a lie), ordered a serve of the raw sushi. I liked the novelty of this, the raw carrot playing a strong part, but I'm not sure I'd personally order this dish. Danni and Jo ordered from the brief wraps menu; Jo a chickpea wrap with a side of noodle salad, and Danni a lentil wrap. The filling for both of these was very nice, but the portions were quite large and Danni at least had difficulty finishing. 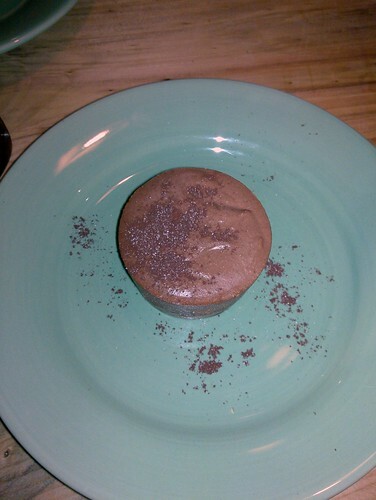 To round out the meal, we ordered two raw vegan cheesecakes to share. There were three on the menu, and we deliberated, picking two; then they brought us all three, one on the house, declaring two just wouldn't be enough! This was lovely, and indicative of the service we had all night (friendly, accommodating, no hovering), but proved a problem for us in the end as we struggled to finish! Totally worth it though. 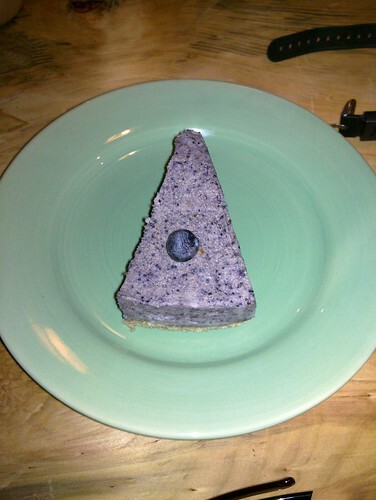 The three varieties were blackberry, green tea, and chocolate. A vote on the way back to Brunswick saw three votes for green tea and one vote for berry. Lots of GF options. The menu is still a little limited, as they've only just opened, but there's a nice range available from which to choose. 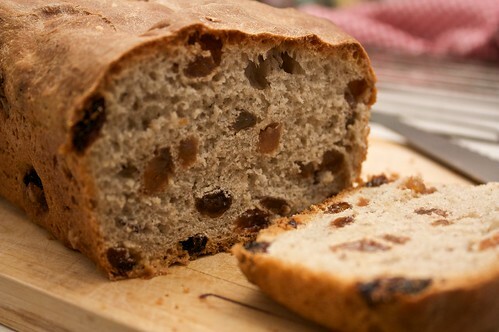 One morning D came running into the kitchen, declaring a sudden urge to bake fruit bread. This was a first attempt, a modification off one of our usual bread recipes, and it was exciting to bake! 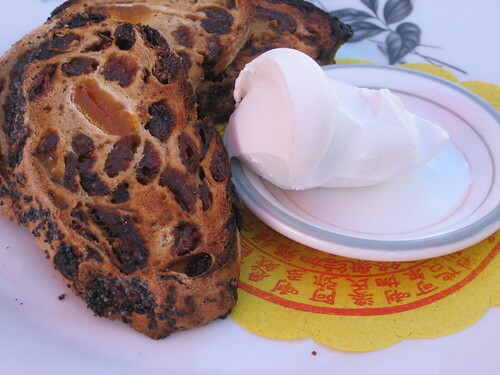 I love fruit bread. 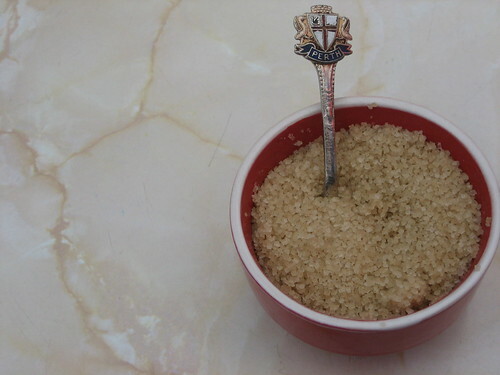 Activate the yeast in the water, then add the sugar. Leave to do its work for ten minutes, then combine together with all of the ingredients. Knead well for ten minutes, then coat thinly in vegie oil, and leave to rise for an hour or two, covered, in a warmish spot. 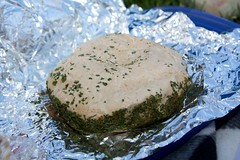 After it has risen, knead another five or ten minutes, then move the dough into your bread-shaped baking tray. Leave the dough to rise again in the bread tin (about forty-five minutes). Bake for 40 minutes at 180C. D made dinner tonight, and we were both feeling lazy and tired and, inspired by several recent posts (maybe by Carla and Wanting Kneading? 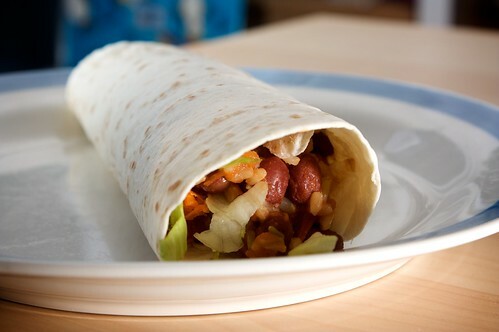 ), D whipped up this amazing rice and beans burrito. It was so delicious, I only paused in eating it to exclaim "this is delicious!" several times. I'm a little disappointed that tomorrow's lunch is put aside for a work Christmas function, so I can't eat the left overs - that will be D's delight! This was delicious, and so fast and simple, I will be making this again very soon. This is only GF dependent on your wrap, so make sure to check. Cook the brown rice in two cups of water with half a veggie beef stock cube or equivalent. In a little oil, fry garlic, fresh basil, chilli, cayenne pepper, cumin, paprika and oregano for a minute or two, then add the tomatoes and kidney beans. Stir well, and leave to simmer for ten minutes with the lid on, stirring occasionally. After ten minutes, check to make sure the mixture has reduced well, then add the tomato sauce, rice, and no more than a quarter of a cup of water. Simmer for another five minutes. Serve warm on an tortilla, with various toppings. 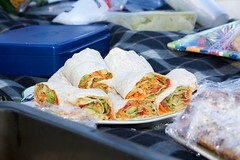 Wrap and eat, messily or otherwise. *I've been getting a lot of 'what is that?' questions lately in regards to various things that I know people have in the US, they just don't know the name we use for it! In this instance, I mean ketchup. I am very fond of curries, it is one of the first things people learn about me. I have many old staples, things I make all the time, but I love discovering new and delicious curries. 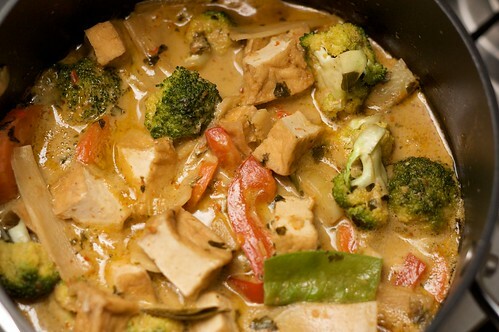 This recipe was an attempt at a Thai red curry - it is good, slightly coconutty and quite delicious, but it is not exactly what I was going for, and so the experimentations continue. Don't get me wrong though, I will definitely make this again. Crush the lime kaffir leaves. 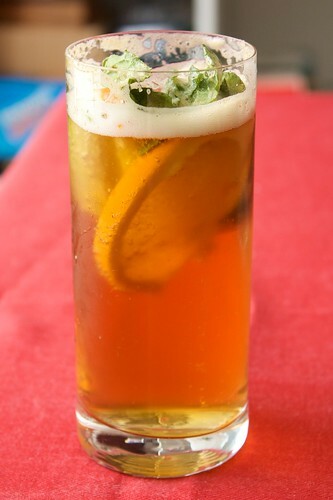 Soak the chilli flakes and the lime kaffir leaves in a tiny amount of hot water, just enough to cover them. Leave for ten minutes. In the meantime, roast the coriander and the cumin until fragrant. Pound together all of the ingredients. handful of tofu puffs, sliced into small squares. Dry fry the curry paste, then as it begins to smell delicious (only a minute or two), add a little bit of oil, then toss through the harder vegetables (such as carrots and capsicum, bamboo, or potato), and coat well. Add the coconut milk and lemongrass, and bring to a boil. Reduce the heat, and simmer for five or six minutes, covered. 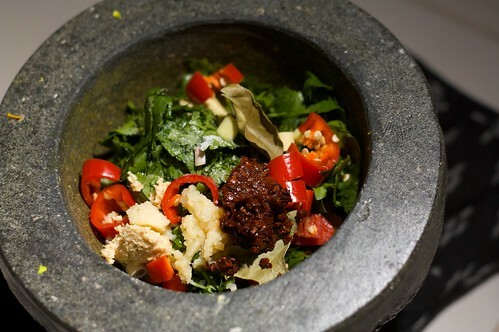 Add palm sugar, soy sauce, lime kaffir leaves, vegie stock, and any appropriate vegies such as brocolli. Simmer for another ten minutes, covered. By this time all the vegies should be tender or just tender. Add the snow peas, and simmer uncovered for five minutes. Stir through the basil (and bean shoots if you're using), and let sit for five minutes, before serving. On my recent request for breakfast recommendations, wanting kneading suggested Pearl Oyster, in Thornbury. Located on the corner of Miller Street and Gilbert Road in Thornbury, it is quite near to some of our friends, so when they suggested a Friday morning breakfast, it seemed the perfect opportunity to try it out! Wanting Kneading implied it was difficult to get to by tram, but actually it is no problem - catch the 112 up and there is a stop right outside. Like many of the cafes around Melbourne, Pearl Oyster has that quirky miscellaneous feel - spoons and plates that look like they've been scrounged from the op shop or some Nan's collection, old signs, and some text books of such a nature that I fear for any children who took that as the truth. 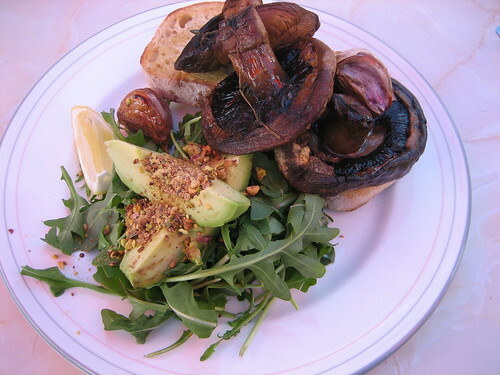 After a small perusal of the menu, and a lot of chatter (and some coffee spillage), I decided to combine together two menu items - the roasted mushrooms on toast with rocket, with the avocado and dukkah on toast. This dish was delicious! 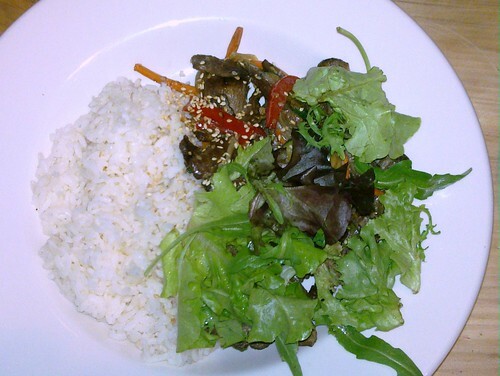 The mushrooms were succulent and juicy, and the avocado was just perfect. The dukkah and lemon added a lovely flavour to the overall meal. I could eat another portion just thinking about it! D went for the fruit toast with tofutti cream cheese. 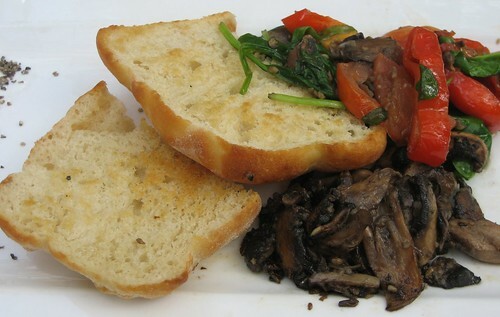 Although the portion size was quite small, this toast packed a punch! The bread was incredibly flavoursome, and worked perfectly with the tofutti. J and DB, our companions at breakfast, ordered various eggy things. J was moderately pleased with his lean green eggs, and DB was very happy with his omlette with sambal. Although it was a slightly chilly morning (Melbourne WTH), the sun came out and it was nice to sit in the (no smoking) courtyard, so I ventured inside to check out their cakes on display. To my joy, there were vegan cakes available! 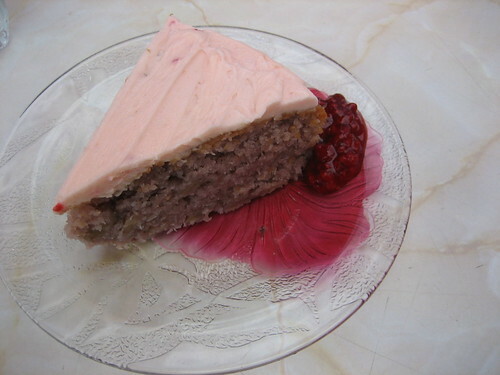 I ordered two slices of raspberry coconut cake, which were from Sugardough. We were super pleased by the service, most notably by their thoroughness. The Sugardough cakes had been provided from Sugardough with I forget the name, the silver balls that are used for cake decorating. Our waitstaff noted that these balls usually contain gelatin, and so called Sugardough to check for us (Sugardough, as it turns out, sources these especially so they are vegan). And then they brought us a serve of raspberries to pour all over our cake! I was really happy with my meal, and the atmosphere was friendly and lovely, and it was a great morning out. I will definitely return, probably for the mushrooms on toast again! I'm in the FOE bookshop all day today, so come visit me if you're around Fitzroy! Do some ethical shopping! Say hi to me! Get a tasty piece of cake! Here's an article to read: Shoppers unconvinced about the impact of their ethical shopping choices. You can make a difference! Even if many people don't believe it! We might be doing St Kilda incorrectly - after all this time, the only notable vegetarian eatery at which we've dined is Lentil as Anything. We've eaten at Big Mouth twice, though. The first time, on the grounds that the menu contained a vegan burger (it did not). The second visit was because Lentil as Anything was closed, and we were very, very hungry. The first time, I ordered these chips. "Are you sure?" cautioned the waitress, who didn't believe I could eat the chips and my meal. I will confess that she was almost correct - the portion size of these chips is significant, and we did struggle, but they are delicious. 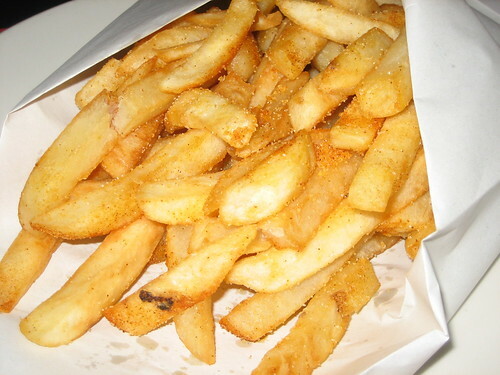 In fact, G, on his recent visit to Melbourne, declared the Big Mouth chips more delicious than the Lord of the Fries chips (though he concedes this could have been because LotF chips were talked up). The great thing about these chips are the spices on them, giving a really great flavour. 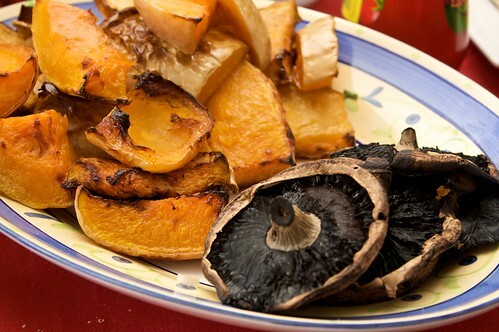 There are only a small number of items on the Big Mouth menu that are vegan or easily veganisable. As a result, on both visits D and I have ordered one of two dishes, and swapped halfway. 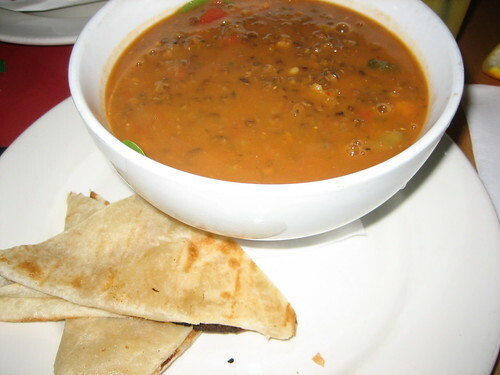 Featured here is the Surjit's Bowl, a lentil soup. It is delicious, and served with a side of roti. On the menu it comes with yoghurt, so you need to order it without. We have also sampled the Indian Kitchen, a chickpea curry, which is heavy on the vegetables and the coconut milk, so quite rich and heavy, but not overwhelmingly so. Whilst Zanchey and Sheebaface were in town, aside from taking a week off work I tried not to let it completely mess up my schedule. So I still did my FOE shift, and one night I went to class as usual. Sheeba went to Camy's for dinner with an old school friend, and I left D and Zanchey with instructions to provide dinner. 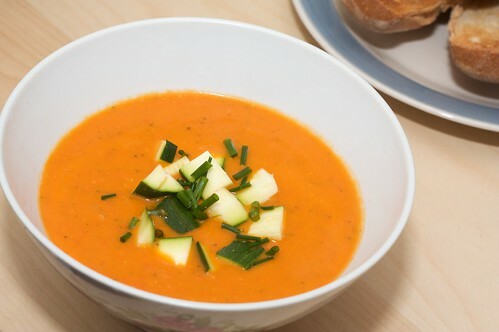 Zanchey volunteered, and produced this delicious, full-bodied capsicum soup. 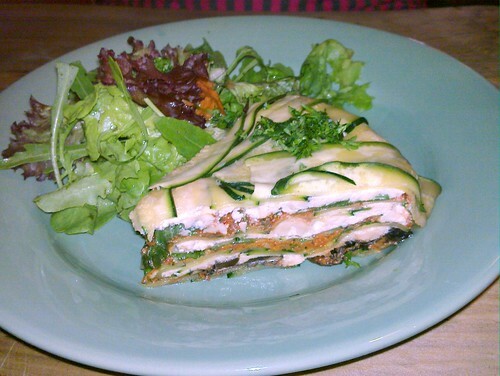 The flavour of the capsicum was not over-powering, it was underpinned by the zucchini and very tasty. Brown the onions in the oil; add the garlic and cook for 1 minute. Add the capsicum and half the zucchini and fry for 5-8 minutes (or until soft and brown). Add the stock to the pan with salt and pepper. Bring to the boil, then reduce the heat, cover and simmer for 20 minutes. When the vegetables are tender, blend the mixture in batches to a smooth soup, and then return to the pan. Good hot or cold. Serves 4. On my first day back at work after a full week off, I had to spend all day in Fitzroy in meetings. So D took advantage of my location to meet me for lunch. Las Vegan being closed on Mondays, we thought we'd give Soul Food a go. I recalled being told their lunches weren't great, so I reached for the breakfast menu. I was immediately drawn to the Monster Vegan Brekkie, and lacking anything else that really strongly tempted me, ordered it. I really liked this! The hash browns were soft in the middle but crunchy on the outside (which I love). 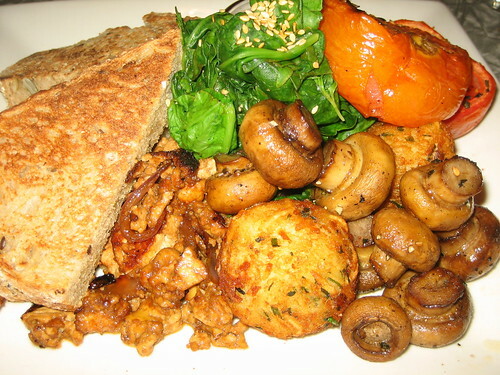 The scrambled tofu had this great flavour, I suspect from the caramelised onions. The bread was also pretty amazing, which was unexpected - I'm used to really thick bread being nice but difficult to chew, but this was fantastic. 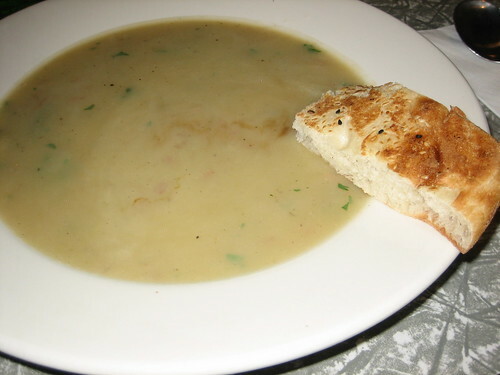 D ordered the Soup of the Day (always vegan and GF), which was potato and leek. This was good, and came with some nice turkish bread on the side (of which there could have been more). However it was a little bit salty. Anyway, nice, if not mind-blowing, interlude, before I returned to meetings. The Walk Against Warming is today. Melbourne is 1200 at the State Library, Perth is 1100 at the Cultural Centre (ie, the stairs/amphitheatre outside Alexander Library). I don't know about the accessibility of any of the routes. Please go! Actions speak loudly, and all that. Continuing in my hunt for an adequate CKT in this city, I was working in Fitzroy today and took the opportunity to try out the char kueh teow at Penang Affair. It was great. 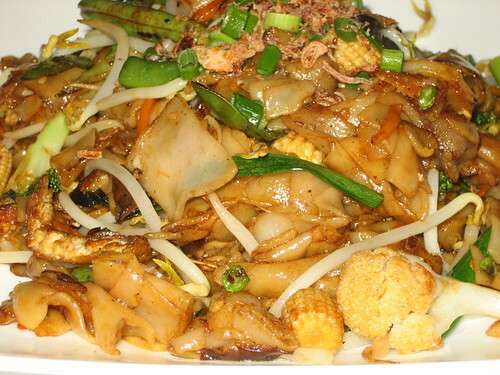 Very vegetable-filled, which is not the usual thing (beanshoots and spring onions only). Lots of mushrooms, bean shoots, snow peas, and some broccoli, and some tofu puffs sliced thin. The wok hei was not as strong as I am used to, however. Although the CKT was very filling, I allowed myself to be upsold by the Chinese-Malaysian uncle who owns the restaurant. Lunchtime special is $13.50 for an entree and a main, so, having finished my main, and not quite bao le, I ordered a serve of spring rolls. These were pretty good also! 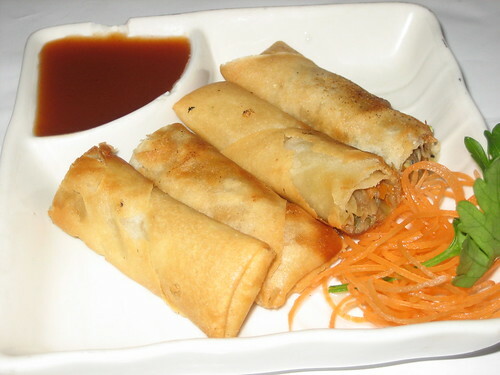 But good spring rolls are easy to find; good char kueh teow less so. I will definitely return for the char kueh teow at Penang Affair again, and I look forward to sampling the rest of the menu. 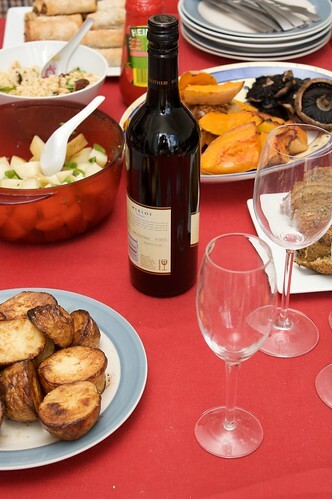 Although the restaurant is not vegetarian, the manager there is strict vegetarian, and as a result there are a lot of things on the menu that are already suitable or easily modified for vegans. And I've just noticed on the menu that they have a vegetarian laksa, how did I not notice this before? Maybe it's better than every other laksa I've had in Melbourne (not hard). Lots of Gluten Free options available. We are totally going here for my birthday (note it in your books). I love going to markets, especially crafty arty markets. My favourite at the moment is Rose St Market, and not just because our buddies at Fair Weather Friends are there. Another market I'm enjoying of late is North Side Makers Market, an approximately monthly craft market held in Northcote. One of the things I've always longed for at markets are those delicious sweets, beautifully decorated cupcakes and great looking slices. Since going vegan, I often look at these stalls in hope, and turn away in disappointment. Yesterday was D's birthday, so we celebrated by going out for breakfast at Grigons & Orr Corner Store, in North Melbourne. This was delightful little cafe was recommended to us by Meveg in my request for recommendations, and seconded by Lidia. It was amazing! I will absolutely be going back there again, it was so good. Grigons & Orr is this tiny little corner store. There are only three very small tables inside, but several more outside, and there were blankets out for use. We managed to snag a table inside, next to the fridges stocked with the usual soft drinks as well as things like Cherry Coke. 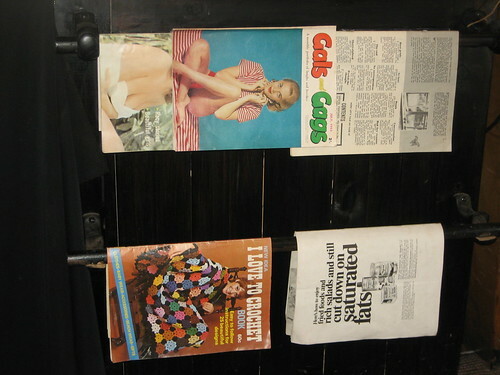 Behind the bar, the shelves were stocked to the ceiling (literally - they required a ladder to get things down) with corner store items, like matches, soap, and coconut milk. 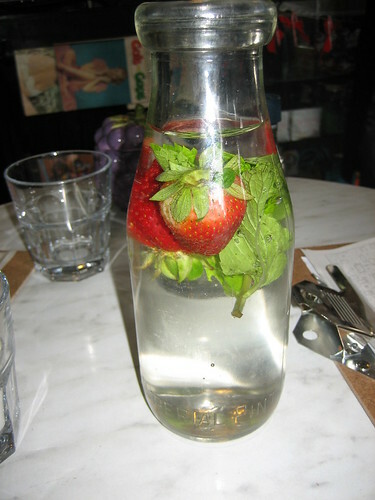 We were promptly seated and served a jar of strawberry water. After much deliberation, we were able to order, and our waiter was very helpful. 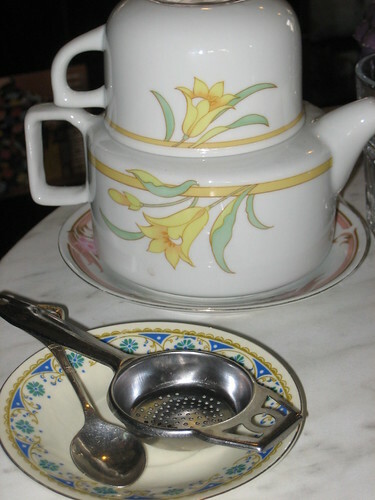 Greg's pot of tea came with a matching tea cup, which I liked! I love these types of pots. Kind of old-school ugly, but also kind of cool. D had a soy flat white (they have bonsoy), and I went for a hot chocolate. After a very short wait, our food arrived. 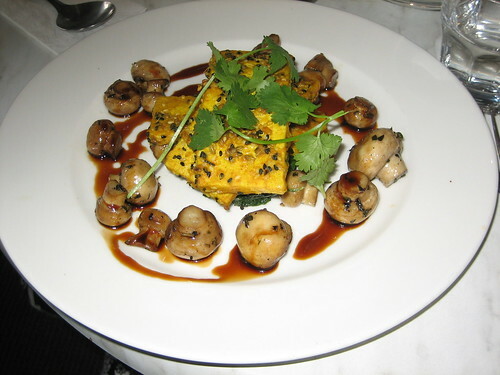 D ordered the crispy pan-fried tofu with spinach, mushrooms, and spice infused soy sauce dressing (the menu online says honey, but this is no longer in the sauce, so it is all good for vegans!). The tofu is also coated in sesame seeds. This dish was so delicious, I am definitely going to order this next. D found its quantity very slightly lacking, which was fine, because I found my dish way too much, so there was plenty left over. 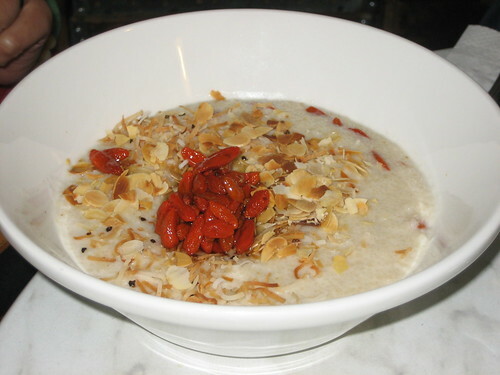 I ordered the cous cous porridge with coconut cream, goji berries, toasted almonds and shaved coconut. This was enormous and amazing. So good! It comes with honey, but you can get agave honey, which I chose not to get but I think the addition would have made this dish stupendous. I am not a big fan of cous cous but it wasn't really cous cous-y at all, it was just delicious. The coconut flavour wasn't overwhelming, it was just rich and slightly sweet, and the addition of the almonds and shaved coconut added a crunch to the porridge and it was brilliant. I must eat this again. For those who are not vegan, G ordered the apple fritters with marscapone, which he really enjoyed, and the wider menu includes other fun-looking options and sides (including a snickers milk shake). Gluten Free options are available.